Introducing the New Anzula Winter 2016 Colorways! These four beauties are making their debut just in time for TNNA—speaking of stoked. Even if you're not running amok at the trade show you can be among the first to see our new colorways. Without further ado (drumroll, please. ), here they are! Alice is a crisp, bright blue that evokes big blue saucer-eyes and insatiable, childlike curiosity. Next stop, Wonderland! Lottie is a sophisticated gal, smooth and cosmopolitan. Her friends only admit in hushed voices that they are green with jealousy over her richness and complexity. It's Opals to Oranges, m'dear. A sleek gray with different hues of lavender striated throughout, Opal's multi-dimensional effect is elegant and ever changing just like the gemstone. Put this one on the list for every October birthday on your knitting list. Frenchy from Grease called, she wants her failed cosmetology practicum back. But really, is there anything more nostalgic than a good Bubblegum pink? Gaze into the twisty ply and remember all the Bubble Tape you talked your mom into buying for you. So there you have it: the winter 2016 colorway line-up. 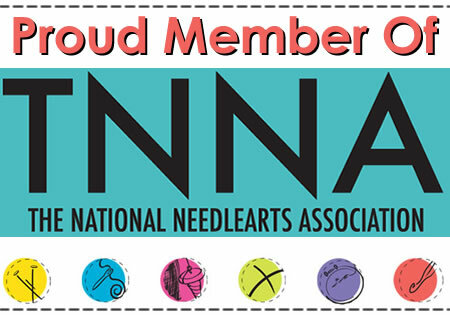 We hope that if we don't see you at TNNA, we will soon as we embark on another tour!